Observers of the abandoned lots and empty buildings by the Delaware River in Fishtown might be surprised to learn that at one time they were the site of a utopian experiment. 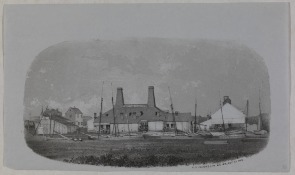 Located just north of the old Gunnar’s Run (centered roughly where Beach and Richmond Streets intersect today), Dyottville began as a novel experiment in factory labor. In the early 19th century, Dr. Thomas Dyott initiated a new system of “moral and mental labor” in order to undercut European-made glass, which was of a high quality yet very expensive. For five years, he ran a company town that spanned over three hundred acres (most of which were taken up by his farm), employed and housed 250 to 300 workers at a time, and boasted 50 buildings, including a bakery, a shoe shop, a tailor, a dairy, a hospital, a chapel, and a school – for the “education of such a mass of human ignorance.” The Dyottville Glass Factories were established in the 1820s on land that John Hewson had used for his famous calico printing factory in the 18th century (in fact both men inhabited the same dwelling house). They were a presence there until 1923, after which Cramp’s shipyard appropriated the space. 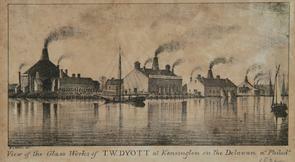 Dyott viewed himself as a benevolent leader and innovator, taking the responsibility of reshaping and uplifting “the great mass of people” into a happy and virtuous “community of operatives.” He believed this project would initiate the widespread utilization of factories in America without the negative effects seen in Europe. According to Dyott: “The great end of all human institutions is social happiness. The factory systems of Europe have degenerated into mere themes for declamation, because the industry that amasses Riches for one, created Misery for thousands…in the Dyottville System…social happiness is there made the basis of factory wealth; and the prosperity of each member of the little community is made the fertile fountain of wealth to the proprietor.” He believed his system would mutually benefit the proprietors and the workers; the proprietors with better workers and therefore greater profits, and the workers with good health, improved morals, and the possibility of owning their own property someday. He also claimed its productive capabilities could bring America self-sufficiency in trade and therefore national independence. After supper Dyott’s young men spent a short time at physical recreation or music education. Dyott, believing recreation essential to health, allotted a large field just for that purpose. There, the apprentices could “amuse themselves in shinny-parties, foot-ball, sky-rocket, and other gymnastic exercises, of which they are fond…as no restraint is imposed on these innocent diversions, although the eye of an instructor is at all times upon them.” They could also learn to play the flute and were instructed in “Sacred Vocal music.” Every Thursday night, Dyott held a Singing School in the Chapel, attended also by neighborhood people living outside Dyottville. Dyott allowed his workers to sing only songs that would aid in their moral uplift: “all vile and obscene songs, have been superseded; which, in former times, the workmen and apprentices were accustomed to indulge in when at their labor.” Here we see that the regulation of self expression in Dyottville was total: traditional worker customs had to be rooted out for the creation of a new, morally advanced and ultra-obedient operative. Dyott educated his workers so that they could escape the “beastial degradation” characteristic of working people, but did not want to over educate them with anything he saw as impractical (or, perhaps, threatening). Before bedtime (8:30pm for the younger boys and 9pm for the older ones) they would take classes in reading, writing, and arithmetic. He taught them multiple trades, enough to make them successful operatives in his village. He believed this system could become the educational foundation for the whole country: “I have necessarily been compelled to connect labor with the whole system of moral and intellectual Education; in order to rescue mere animal power from the curse of ignorance, and to enlighten it in the path of duty…it may become the Exemplar of a National and State System of Manual labor Education.” At a time when the subject was hotly debated, Dyott believed that the public should be educated in the useful arts—a belief driven by what Dyott himself explained as enlightened self-interest. Though his system was characterized by mental and behavior control, Dyott believed it perfectly “congenial to all the Rights and Habits of a free people.” Dyott claimed that the recruitment of malleable young boys made coercion unnecessary. “Persuasion, example, and system, do away with all thoughts associated with the idea of compulsion. The action of the mind to obedience is spontaneous; coercion is unknown and unnecessary; and hence no sensation of being fettered is experienced.” He also stressed the absence of corporal punishment in his village due to the efficacy of his methods; if a boy broke the rules, he would not be allowed to visit friends or relatives on Sunday, the only day in which a slot of time was set aside for leaving the premises. Yet some of Dyott’s contemporaries questioned the type of not-so- subtle control they observed at Dyottville. These critics, who were sometimes self-interested competitors simply worried about Dyottville’s ten-hour days, helped block Dyott’s petition to the state legislature for incorporation of Dyottville in 1834. The experiment ended in during the Panic of 1837, when Dyott was unable to handle multiple runs on his private bank. He declared bankruptcy and was sent to Eastern State Penitentiary for three years at hard labor in solitary confinement. After leaving prison, he returned to the drug business of which he had been a part prior to his venture in social engineering. The glass factories reopened on a much smaller scale by 1842 and were run by the Benners family until 1923. By World War II, the entire area was owned by the Cramp Shipbuilding Company. 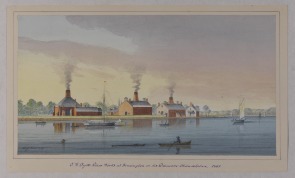 Despite anyone’s opinions of Dyott’s methods or his ideas regarding “the great mass of people,” his “apprentices were extraordinarily well housed, clothed, fed, and paid, compared with factory workers in general and glass-factory workers in particular.” And today, the tangible remnants of this utopian experiment—Dyott’s collectible glass products—often turn up in the yards of Fishtown residents. "Dr. Thomas W. Dyott: A True Renaissance Man" by Kevin A. Sives. Dyott, T.W., M.D. 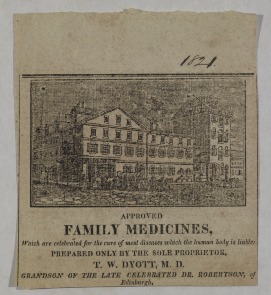 An Exposition of the System of Moral and Mental Labor established at the Glass Factory of Dyottville, in the Country of Philadelphia. Report of the Committee Chosen to Investigate the Internal Regulations of the Place. Philadelphia, 1833. McKearin, Helen. Bottles, Flasks, and Dr. Dyott. New York: Crown Publishers, Inc., 1970.